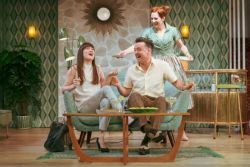 Moving into the Duke of York’s Theatre from a heavily lauded run at the National Theatre, Home I’m Darling is the latest play written by Laura Wade to be performed in the West End after her 2010 success with Posh. 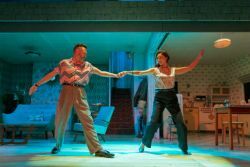 Taking audiences back to the 1950’s, it’s a play with exaggerated gender stereotypes, as gender roles come to the fore in this comedic production. The differences between the present day and decades gone by are made apparent in this show, which harks back to nostalgic times gone by. So, if you’re looking for a West End production to make you laugh and think all at the same time, Home I’m Darling is the show for you. When Judy, a professional businesswoman unexpectedly finds herself redundant, she sees this as an opportunity to adopt a new lifestyle; that of a 1950’s housewife. Escaping the hustle-bustle of modern day life, everything seems to be too good to be true, being able to live a carefree lifestyle while married to her now-breadwinner husband Johnny. As the honeymoon period fades, being a good 1950’s housewife isn’t all that it seems. With the story developing, audiences learn what it takes for Judy to be a domestic goddess. This isn’t the first time that a National Theatre production is transferring to the West End. In 2019, The Lehman Trilogy will also transfer to the West End, as well as previous shows including The Curious Incident of the Dog in the Night-Time and Nine Night. But, there’s something special about Home I’m Darling and how it successfully blends old and new gender expectations into a seamless production. It’s a show that is bound to get everyone talking, so don’t miss out on the limited engagement and book your tickets now for Home I’m Darling. 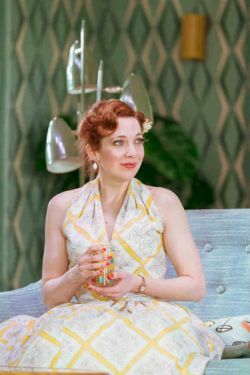 The show stars Katherine Parkinson as Judy, whose performing credits include The IT Crowd, Humans as well as plays including Dead Funny and Absent Friends. Laura Wade has written 7 plays, with her first play Colder than Here playing at the Soho Theatre in 2005.